Head of the Classes | Features | Kids VT - small people, big ideas! 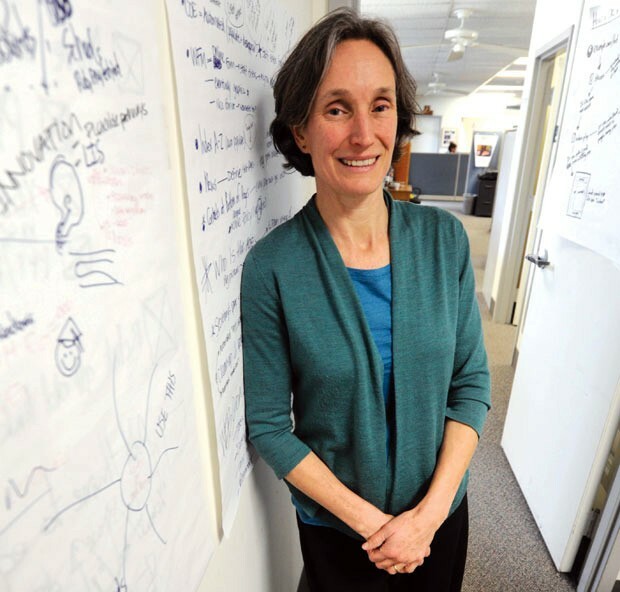 Rebecca Holcombe, Vermont's new Secretary of Education, has an ambitious vision: to close the gaps in learning opportunities. Public education, she says, is "the civil rights issue of our time." But Holcombe herself isn't the product of U.S. public schools. The daughter of United Nations workers, she went to U.S. government-run international schools in Afghanistan and Pakistan, followed by boarding school just outside Boston. Holcombe's interest in public schools came later in life (see "From Afghanistan to the Upper Valley"). After earning degrees from Brown and Harvard universities, she taught at a middle school in Hanover, N.H., and earned a reputation as a visionary young principal in Fairlee, Vt. In January, Holcombe, a 47-year-old Norwich resident and mother of two public school students, will leave her job as director of the Teacher Education Program at Dartmouth College to replace outgoing Secretary Armando Vilaseca. Holcombe inherits a school system in which declining enrollments, shrinking financial resources and a rapidly changing global workplace are forcing Vermont parents, educators and officials to rethink their approach to public education. She says her first priority in January will be to meet teachers, administrators and agency staff, then sit down, listen and learn from them. While she declined to address recent controversies such as Chittenden County's effort to adopt a year-round school calendar, Holcombe gave Kids VT a preliminary read on her approach to education. KIDS VT: What was it like growing up with such an international background? REBECCA HOLCOMBE: The power of living abroad is you have to look at yourself from the outside. When you're in one of those international schools, you're going to school with children from so many different countries. That challenges you to think about things you take for granted. You realize quickly how important language facility is to doing well ... It's an incredibly privileged way to grow up. KVT: What were some of your biggest frustrations as a teacher? RH: Any time you're doing anything in a democratic institution, part of it is dealing with conflict. That doesn't bother me ... But this work is really hard, and it's really hard to teach well. I wish people understood how complex teaching is, because it's easy to judge from the outside and say, "You should be doing better." What sometimes is hard — in the context of high-stakes accountability where you're giving students these tests and constantly getting feedback — is if you don't measure up, there are punitive consequences ... We've got to stop talking about test scores and start talking about the act of teaching. KVT: How do we do that? RH: We need to move beyond this national narrative of school failure, which I don't think is accurate. We've got to be comfortable talking openly about what we're doing, the same way we'd expect from our doctors. If they made a mistake, we want them to sit down and diagnose it so it doesn't happen again. We need to be able to do the same thing in our schools. KVT: Why is the narrative of school failure inaccurate? RH: The reality is, schools are actually doing better now than they've ever done. Vermont has some of the highest graduation rates in the country. Our graduation rates are much higher than they were 50 years ago. We have kids going to college who wouldn't have gone years ago. We have kids going to school who wouldn't have gone to school years ago. Our test scores have been rising. The federal government just published a report that placed [Vermont] seventh in the world for math and science ... So, we need to have a more sophisticated conversation about what it means to do well. KVT: How does poverty make the work of schools more difficult? RH: The real challenge is that we have growing child poverty. We know that child poverty is associated with higher levels of special education services, because if you're not getting adequate nutrition in utero, you're going to have problems later on in life. Poverty causes stress and stress suppresses working memory. That impairs school performance. So, it's not that our schools aren't doing well; it's that we have these changing social dynamics, which are going to make it more difficult for children to learn. KVT: Should universal preschool be a mandate? RH: It should be an opportunity. Though this is still in the early stages, we need to find ways to work with the people and agencies that are already providing early education services to come up with clear criteria for high-quality preschool and find the resources to support them ... We don't have the specifics for how that will work yet, but it has to be a high priority. KVT: Should Vermont extend its school day and/or school year? RH: We know from good empirical research in other areas that the opportunity gaps and achievement gaps we're seeing aren't happening during the school day or school year. They're happening in out-of-school time ... You go into any high-income community, those kids are busy all summer. You go into a low-income community, many of them are sitting at home because their parents can't afford camp. That is the achievement gap. It doesn't matter how hard they work during the year. We know those low-income kids lose ground over the summer because they're not engaged, they're not stimulated. Meanwhile, their peers are charging ahead. High-income kids actually gain over the summer, because they're reading, they're supported, like science camps or LEGO robotics. All those enrichment programs not only build and maintain their academic skills; they give you a sense of purpose. KVT: In your application letter you wrote, "We should not make every child college-ready but innovation-ready." What did you mean? RH: I don't think it makes sense for every child to go to a traditional four-year college. What we need is to make sure every child has a choice and has the skills and understanding to be successful in their career, because careers are not what they used to be. KVT: Is too much emphasis placed on attending college as a prerequisite for success? RH: When you go to the drugstore, you check out with a machine. When you fly, you get your ticket at a kiosk. These jobs are going to be gone for students, so we can't educate them for those terminal jobs anymore. We need to educate them to be "innovation-ready" because they need to be constantly reinventing themselves for a very dynamic workforce. They need to be able to handle ill-structured problems and deal with nonstandard situations, because a computer can't do those things. They need to be able to integrate masses of information and use judgment, because computers can't do that, either. Rebecca Holcombe grew up overseas. Her family, as she puts it, "had the bad fortune of arriving in countries just as political trouble was beginning." From fourth to seventh grade, she lived in Afghanistan, until the Soviet invasion in 1979 forced them out. Next it was on to Pakistan, where Holcombe attended the International School of Islamabad — until anti-American unrest scared away nearly all the English-speaking students and teachers. Because Holcombe's family stayed, she got a brief taste of home schooling. "My dad actually had to teach me algebra," she remembers. Holcombe eventually returned to the United States and attended Milton Academy, a boarding school near Boston. But during vacations, she routinely joined her parents overseas, including in Fiji and Sudan. She even attended a year of high school in Spain, and still speaks fluent Spanish. After high school, she attended Brown University, where she met her husband, James Bandler, who went on to become a Pulitzer Prize-winning journalist for the Wall Street Journal. In 1989, the couple moved to Vermont. Though they have spent some time since then living out of state, they currently reside in Norwich with their son, a sixth grader at the public Marion Cross School, and their daughter, an eighth grader at Francis C. Richmond Middle School in Hanover, N.H., which is part of an interstate school district. Holcombe traces her interest in public schooling to her post-graduate studies at the Harvard Graduate School of Education. She didn't initially plan to go into teaching, but while there, she says she realized that "public schools are where it's at. I guess I was coming home and didn't know it until I got there... From there, I was hooked." After Harvard, Holcombe attended what is now known as the Upper Valley Educators Institute for her teaching certification. For a time, she taught at Francis C. Richmond Middle School, then became principal at Vermont's Fairlee Elementary School, where she helped create one of the country's first interstate school districts (see "Consolidation Across State Lines"). Public school, she explains, "is where we achieve equity. It's where we bring each other together and become a civil society. It's the means for making sure every child has a chance." In the mid-1990s, Fairlee Elementary was struggling with dwindling enrollment and limited resources for such programs as art, music and athletics; other nearby schools were confronting the same problem. Faculty turnover in the school district was so high, it was virtually impossible to make lasting improvements. Those are just some of the challenges Rebecca Holcombe faced when she became principal of Fairlee Elementary in 1996, at the age of 29. As a result of her leadership, voters in four towns — three in Vermont and one in New Hampshire — approved the formation of the Rivendell Interstate School District in 1998. Such school "consolidation," as it's called, has been hotly debated in Vermont for decades. On the pro side, it's a way for small schools to share resources, increase efficiency and save taxpayer money. Opponents argue that school consolidation erodes local control and has the potential to destroy communities. Gail Keiling, now head of elementary schools for the Rivendell district, was a new teacher at Fairlee Elementary when Holcombe first arrived and took an active role in the interstate-district planning committee. "She was a very young principal, but you would never know it because she was just so knowledgeable about education and about curriculums," Keiling recalls. "She was really a driving force to help us build this new school system." Doug Tifft, who worked with Holcombe on the planning committee, agrees. He calls Holcombe "a visionary," "an intellectual" and "the Thomas Jefferson of our effort." Holcombe, he says, had a knack for bringing reluctant citizens and stony-faced community leaders to the table, not merely to begrudgingly accept school consolidation, but to embrace its potential. In the end, 80 percent of voters supported the measure. "Throughout the whole process, Rebecca was always able to connect us to the latest understanding of what education could be," Tifft adds. "People didn't feel as though they were leaving something. They felt as though they were creating something new." More than a decade later, the Rivendell District has vibrant language, music and arts programs and the faculty turnover rate is back to normal. What did Holcombe learn from the experience? That community involvement is key. "We had members of the community who were willing to come together in a sustained way over a period of time and ask the hard questions, do the research and figure out what was going on and keep having engaging conversations with the town about what the right outcome would look like," she says. "Townspeople did not feel this was forced upon them. They had multiple opportunities to weigh in through multiple community forums. We involved them very actively in designing all aspects of the project, so people who had concerns were able to bring them to the table."